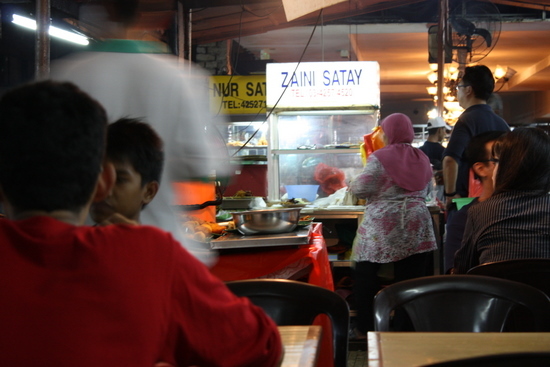 With the diverse ethnic and cultural history of Malaysia, food is often a topic of passionate debate among its people. Many dishes are heavily influenced by proximity, and culinary fusions are not uncommon; for example many of the local Malay dishes have Javanese influence. Possibly the most important dish that defines the Malaysian national identity, ask any local where their favourite place to have Malay food is, and they will list you a hundred and one places that serve the best nasi lemak. Although its name literally means ‘fatty rice’, it connotes creaminess as the rice is cooked in coconut milk. The fragrant rice is commonly served with cucumber slices, crispy fried anchovies and roasted peanuts, topped with a healthy amount of spicy gravy called sambal - a type of chili-based condiment. Extra side dishes can be added to accompany the meal, such as fried chicken, sambal sotong (chili cuttlefi sh) and cockles. 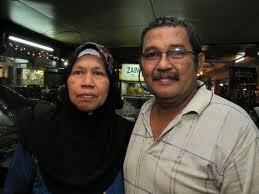 Selera Jaya 223, the food court at Jalan 223, Petaling Jaya is known for its nasi lemak. Served fresh and piping hot, the nasi lemak is wrapped in banana leaf and readily placed on the table; the packets are quite small so it’s not unusual to see people unwrapping two or three packets at the same time. Village Park at Uptown Damansara is always busy and if you want to have lunch during peak hour, be sure to be there early. The rice served at Village Park has a very strong coconut flavour, but compliment it with the sambal and one of their most popular add-ons, the fried chicken—soft, tender meat with crispy skin and you will understand why people are still queuing up outside the shop to have a bite. Rendang is a spicy beef delicacy slowly cooked in coconut milk and ground spices until the liquid begins to evaporated, in which then it will be stir fried until dry, giving it strong complex flavours. It is usually served with ketupat, which is a sort of rice cake; lemang, glutinous rice cooked in bamboo tubes or just plain steamed rice. Rendang is also a very popular accompaniment to the nasi lemak and places like Nasi Lemak Antarabangsa boasts not only great nasi lemak that keeps the customers returning, but also exquisite rendang to go with it. 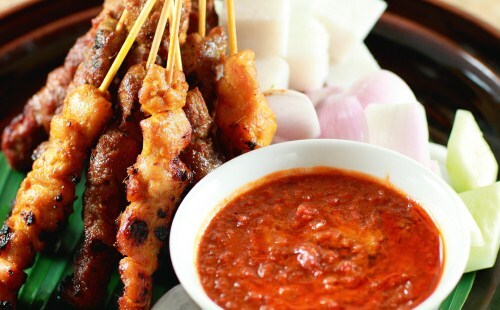 Satay is a popular dish of skewered meat, often served with peanut gravy. Chicken, mutton or beef meat are commonly used, marinated for a few hours before skewered through bamboo sticks and grilled over charcoal fire. 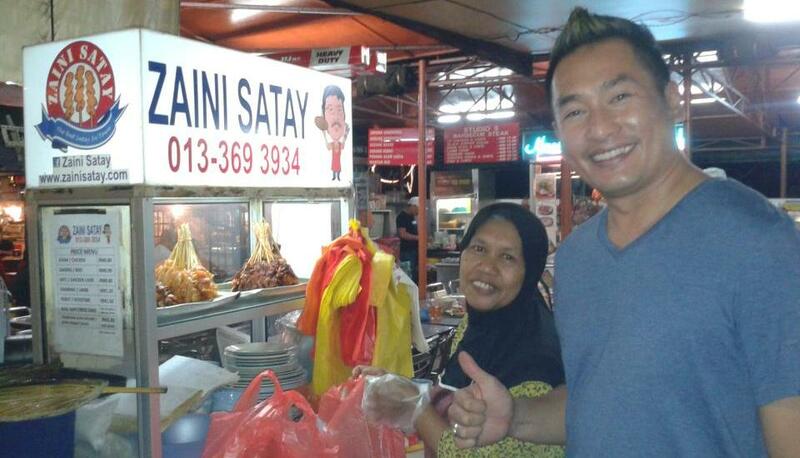 People say that the satay from Kajang is the king of all satay—Satay Kajang Haji Samuri is the face of Kajang satay. The pieces of meat are succulent and tender with scarce traces of fat, nicely charred but never overcooked. 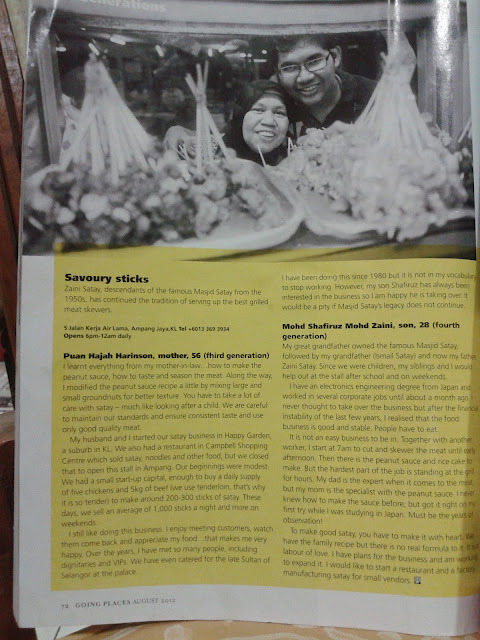 The story went that Zaini Ismail’s grandfather used to sell satay carried over his shoulder with a pole, and locals who grew up in the sixties would remember his shop at Dang Wangi (used to be Campbell Road). 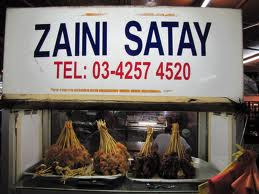 With the recipe now in Zaini’s hands, he and his wife had been operating the store in Ampang serving to loyal customers and travellers who come from as far as Singapore. 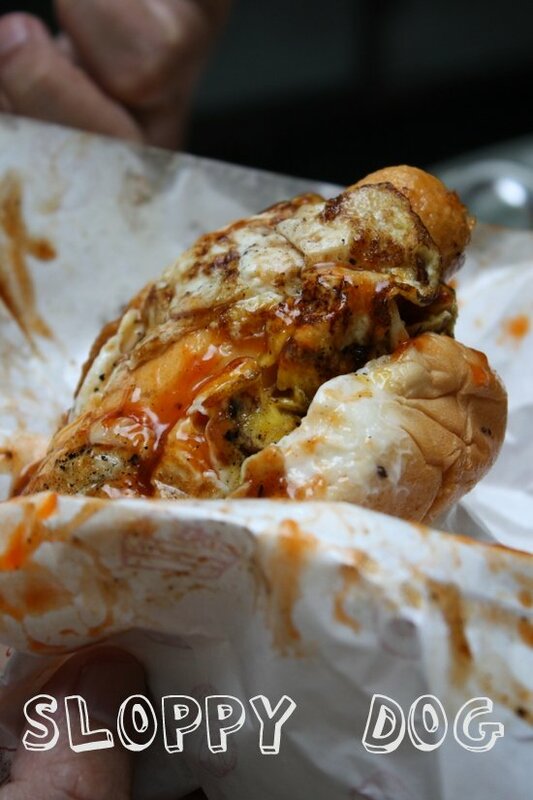 The ubiquitous Ramly burger can be found on almost every street corner of KL, and everyone will point you to a different direction when you ask them which store is their favourite. The Ramly burger is a distinctively Malaysian delicacy usually found in mamaks or stalls by the roadside; each store cooks it a little differently but generally the burger is made up of a Ramly burger patty, either chicken or beef, cooked with margarine, onion, cabbage, and Worcestershire sauce before topping it with mayonnaise. Ask for a Ramly Burger Special and you fi nd it wrapped preciously by a layer of fried egg, sometimes with melted cheese in between the layers depending on what your burger connoisseur offers. OM Burger stall next to Naan Corner has a legendary status. Parked right in front of the 7-Eleven convenience store at Jalan Kerja Ayer Lama, a Javanese husband-and-wife team are operating the stall. OM does it right: thick labs of patty cooked in margarine are removed from the heat when they are still juicy and tender, and the edges slightly crispy. 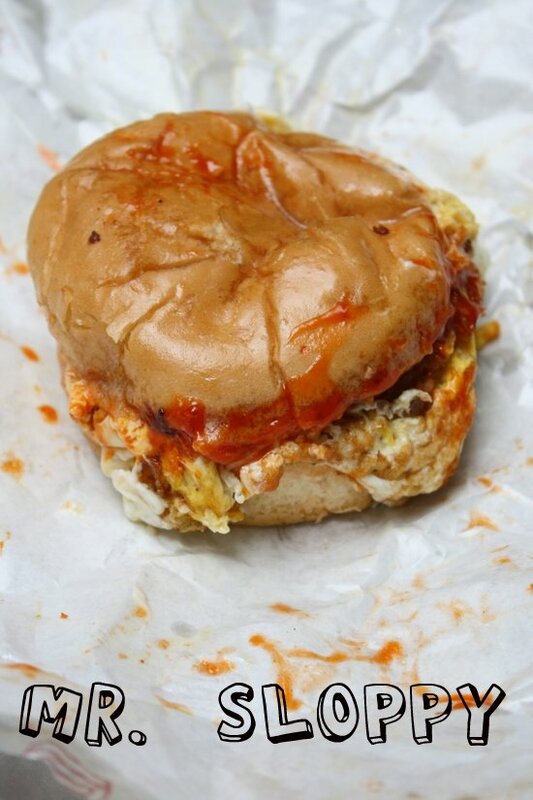 If you’re thinking of taking it home and reheating it in the microwave for supper, forget it—the Ramly burger has to be enjoyed on the spot; by the sidewalk with mayonnaise and chili dripping down your fingers as you chomp onto the hot, freshly cooked meat. These are the places where you will find true Malaysian flavours that locals love and eat on a daily basis, and they’re not hard to find. Good food can be found at every corner of town and a little adventurous scouring will usually result in a delicious fanfare. 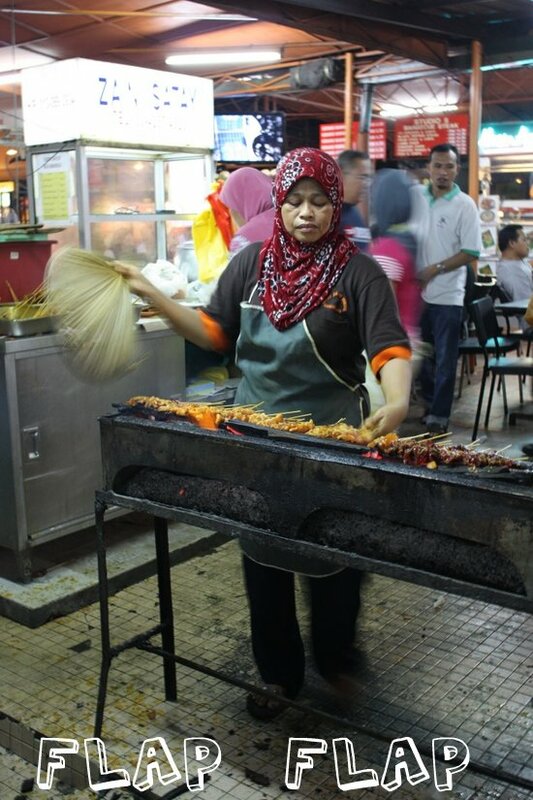 Majis Sate cukup famous di Kuala Lumpur. Tanya sahaja mereka yang pernah menikmati sate yang dihasilkan oleh Majid Sate di Campbell Road dulu (sekarang Wilayah complex). Baik yang Cina, Melayu, India dan lain2. 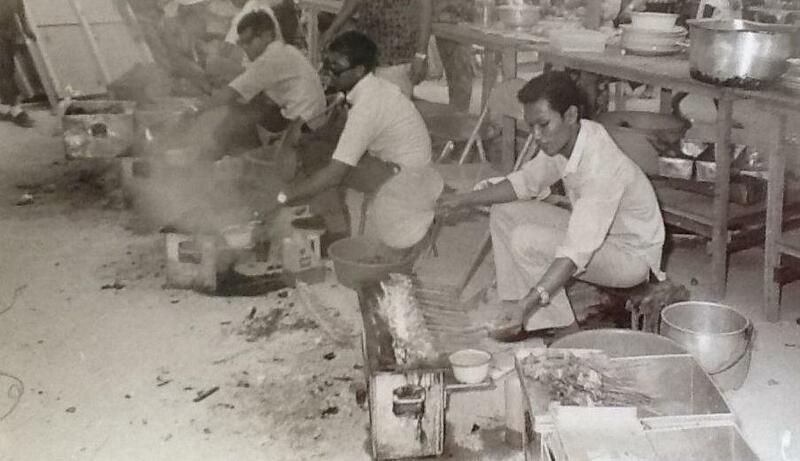 Semua akan kata, sate Majid tiada tandingannya dengan sate yang dihasilkan peniaga lain. Dek kerana kecewa dengan penghinaan yang dilemparkan, datuk pun mengeluarkan belanja sendiri untuk menghantar anaknya belajar Mine Engineering di United Kingdom. Pak Long kembali beberapa tahun kemduian dengan segulung ijazah dalam bidang Engineering! Dan kalau dia pergi ke pasar Chow Kit, tak heranlah kalau sekejap dia berbahasa Hokkien, sekejap Kantonis, sekejap cakap India dengan penjual kacang putih dan sekejap lagi vakap bahasa Benggali dengan penjual roti berbangsa Sikh. 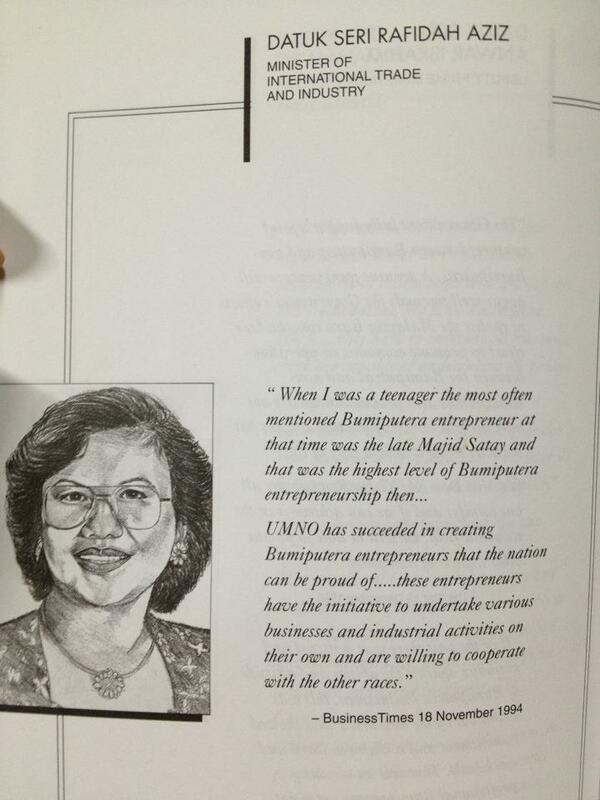 Article from Dapur Kak Jee. No two sticks of satay are created equal. After going on a bit of a trek over the past two weeks, I am happy that I have found a stall I can call my favourite. This little spot, though out of the way for me, is a place I will return to time and time again when desires for tender charred meats arise. 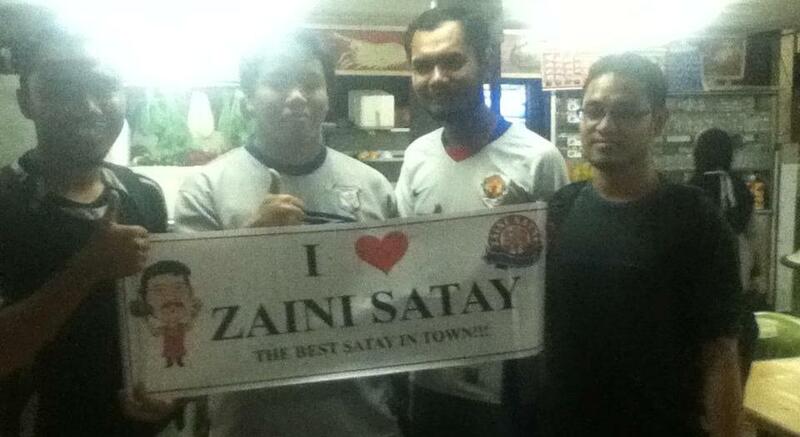 Though the drive over to Ampang is a bit of a put off, the food to be found at Zaini’s is certainly worth it. This stall has been around for 30years and every night you see people lining up to get their fill or packing some to take home for dinner. Either way they are not short of customers and it is easy to see why. The beef satay here is far from tough and rubbery. It is tender and succulent without being fatty. A piece of fat is layered inbetween the chunky pieces of meat solely to keep it tender as it sizzles and chars over the flame. The dripping fat keeps it moist. 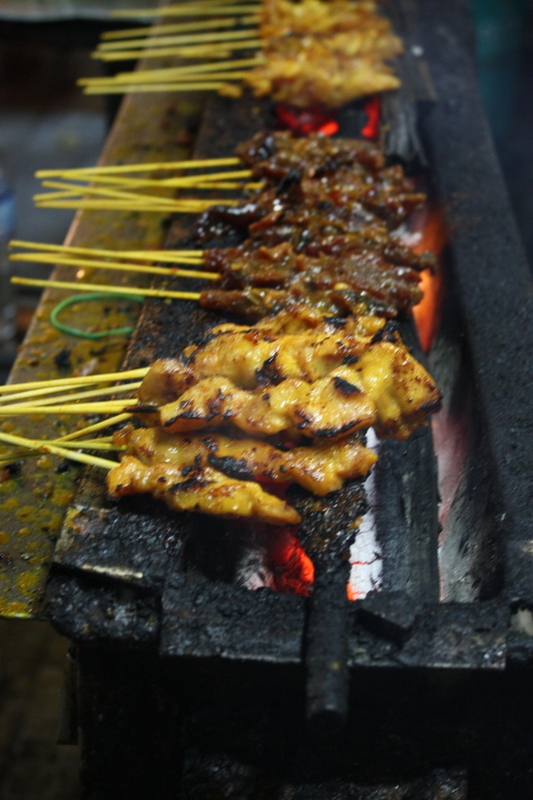 The same goes for the chicken satay that is cooked to perfection. No dry stringy bits in sight. The kuah kacang here, although good is merely an accessory and not a necessity. The charred sticky sweet flame grilled meats are bursting with flavour and hardly require a dunk. I reserve the chunky kuah kacang for my nasi impit, cucumbers, and red onion instead. Delish! 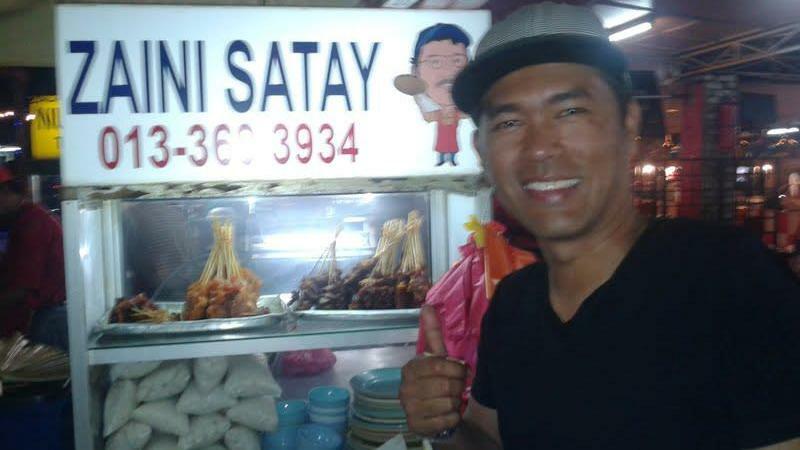 So what makes the satay here different from many of the other stalls around town? If you look closely at the fire it is a blueish purpleish glow indicating much higher heat than the regular red embers. This is due to the use of river rocks in addition to coals, which keeps the heat even, and high. Cooking this way allows the meat to cook fast therefore not giving it time to dry out and overcook. This is the secret to tender moist morsels. Apart from the usual meat offerings, Zaini also sells sticks of chicken liver, perut babat, perut tembusu, and lamb. Aside from the lamb that goes for RM1 a stick and perut tembusu that goes for RM1.20, the rest are 70cents per satay. A packet of nasi impit is RM4. On a weeknight Zaini sells up to 1000 sticks of satay and on weekends they go up to 2000 sticks. Chicken is their most popular item and they have customers drive in daily from near and far to have a bite. Save some space if you eat here though as many of the other stalls will tempt you with their offerings, I enjoyed the nasi lemak bungkus from the stall across Zaini. This is great to have alongside the satay and the sambal has the right amount of savouriness that I enjoy. The roti bom in this food court is another great find, crisp and flaky with that distinct ghee aroma. 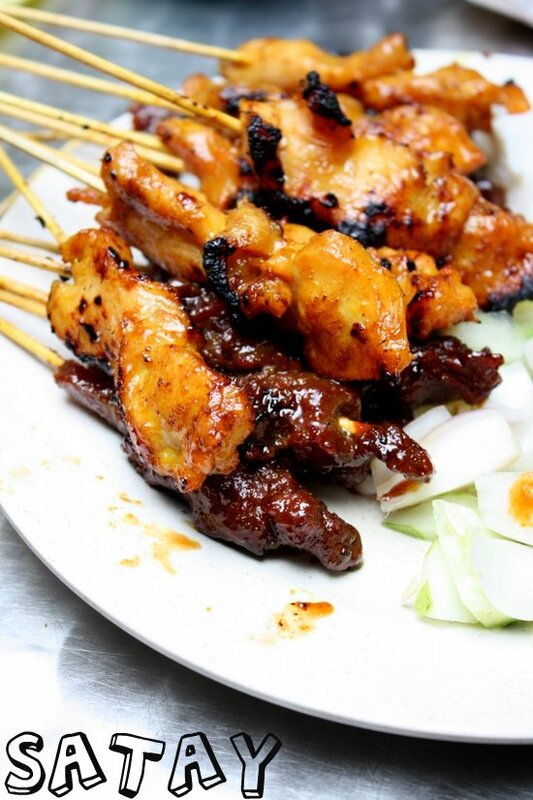 If you have a desire for perfectly grilled satay, this is a must try!